On 10 February 1874, a meeting in Glasgow formed the 'Association for Visiting and Aiding the Permanently Infirm and Imbecile Children brought under notice by the School Board Educational Inquiry'. Alexander Whitelaw MP as was elected as president and William Mitchell as secretary and treasurer. In September of that year, following a fund-raising campaign, the Association purchased a cottage at 340 Gairbraid Street (now 1092 Maryhill Road), where 15 boys and 15 girls could be cared for and educated. The official opening of the Home took place on 27 October. Mrs McLintock was appointed superintendent of the establishment which became known as the East Park Cottage Home. By 1903, the construction of additional buildings at the site had increased the accommodation to 130 places. 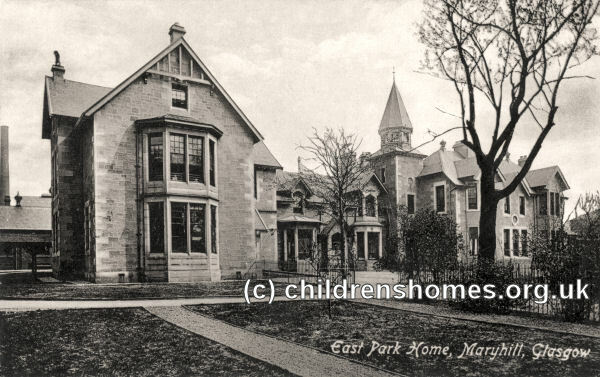 The East Park received children with a variety of disabilities. Despite its name, it was effectively a hospital, its staff wearing nursing uniforms. It facilities included a play room for the younger children and school rooms for the older ones. The East Park charity still provides specialist care and education for children with special needs and has recently completed a major rebuilding of the Maryhill Road site. The original cottage purchased in 1874 is still preserved, however.